It would be cool if the player had the opportunity to improve some things. Alas, today's version of MCPE does not allow you to modify the objects. 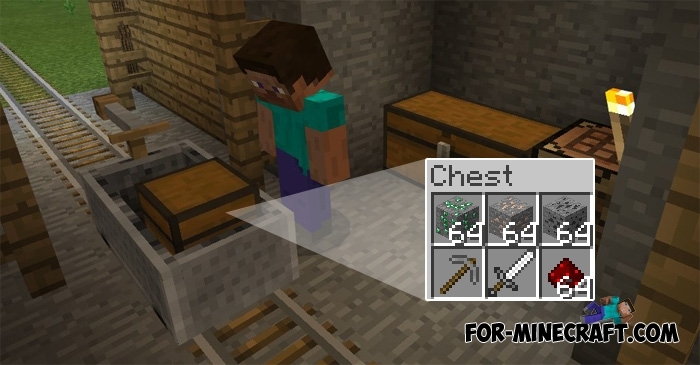 But thanks to this addon you can make a minecart more useful. Your minecart will receive a special cannon that automatically attacks enemy targets along the way, as well as the chest that is inside. You can store items there and use the minecart as a vehicle. Take a chicken spawn egg and throw it on rail tracks. Then climb inside with an iron sword. You can meet these minecarts in the middle of a forest or field, it may seem rather strange. Items in the chest will not be lost if you quit the game. Build rail tracks from any place to your house and put the mine trolley. This way you can shorten the travel time and also protect yourself. To control the minecart you will need an iron sword.